VIMS alumna Dr. Leigh McCallister has won the prestigious Lindeman Award from the American Society of Limnology and Oceanography (ASLO) for research she conducted while a graduate student in the School of Marine Science at VIMS. ASLO presents the Lindeman award annually to recognize the outstanding paper in aquatic sciences by an early-career researcher. With 3,800 members from 58 countries around the world, ASLO is the nation’s leading professional organization for researchers and educators in the field of aquatic science. McCallister's award-winning paper, published in the journal Limnology and Oceanography, described her use of carbon and nitrogen isotopes to estimate the sources and ages of organic matter in the York and Hudson rivers. Her findings suggest that bacteria profoundly alter the mean composition and age of the organic matter that rivers and estuaries carry to the coastal ocean. Her work leads to a better understanding of the fate of organic matter as it is transported through estuaries to the sea, a key conduit in the global carbon cycle. While at VIMS, McCallister was co-advised by faculty members Drs. Hugh Ducklow and Jim Bauer. Ducklow, who nominated his former student for the award, notes that "Leigh's paper demonstrates many attributes of great science: elegance and determination, a new attack on an important and interesting problem, painstaking work, creative analysis, and graceful writing." 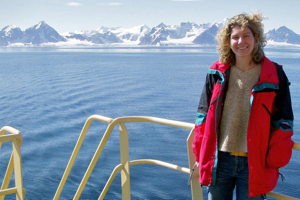 McCallister, now with the Institute of Marine and Coastal Sciences at Rutgers University, will receive a small cash prize as well as the opportunity to present the results of her research at the 2006 ASLO annual meeting in Victoria, British Columbia. For more on McCallister's research, see "Assessing sources and ages of organic matter supporting river and estuarine bacterial production: A multiple isotope (14C, 13C, and 15N) approach" L&O 49: 1687-1702.